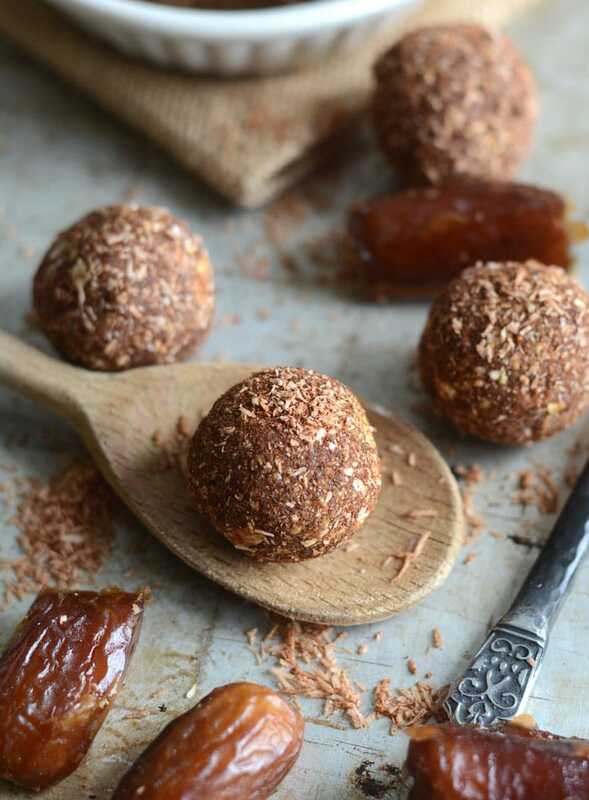 These delicious, low-fat cinnamon energy balls require just 4 simple ingredients to make: medjool dates, oats, maple syrup and cinnamon. Loads of cinnamon flavour pairs perfectly with sea salt and hints of caramel from fresh, soft medjool dates. Bonus: they’re very low in fat with under 1 gram per serving and they make a healthy and energizing snack, breakfast or dessert. You can also crumble them up to make cookie dough bits for your next batch of vegan ice cream. When I’m tracking macros, I find it helps to have snacks on hand that are made of up either just carbs or just fat. That way, if I need to get more of a particular macronutrient, it’s an easy way to do so and enjoy a little treat while I’m at it. 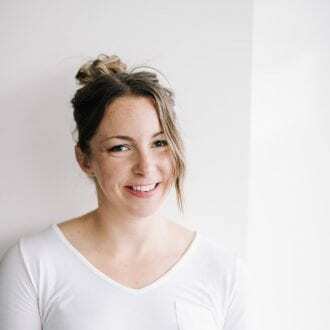 My favourite snacks for this are basic oatmeal cookies, date balls and fat bombs. 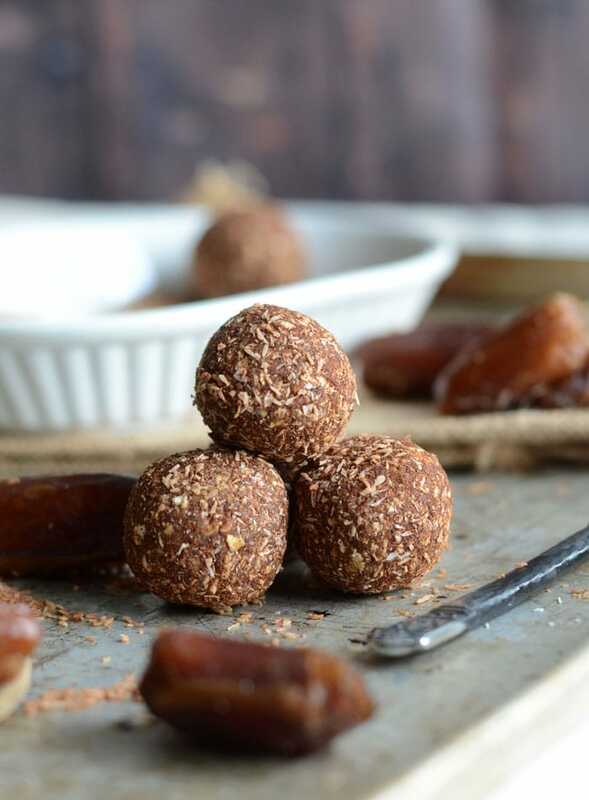 These Fat-Free Cinnamon Balls are mostly all carbohydrates so they’re perfect pre or post-workout as a sweet, little energizing treat. That being said, macro-balanced and higher-protein snacks are great to have on hand too. My Chocolate Peanut Butter Protein Balls are a good one for that. It just depends on what else I’m eating that day and what I feel like. I love nuts and fats but depending on the day, I like having low-fat options too. Chances are all pair these with some healthy fats anyway. They’re especially delicious chopped up and used as a topping for smoothie bowls like my Salted Tahini Maca Smoothie. If you prefer a more balanced treat, try cutting these in half, adding a dab of almond butter or coconut butter and making a little mini energy ball sandwich. Uh, YUM. I know some of you have nut allergies so I like sharing nut-free recipes from time to time. For more nut-free snacks you can try my Nut-Free Chewy Granola Bars or Nut-Free Gingerbread Energy Balls. 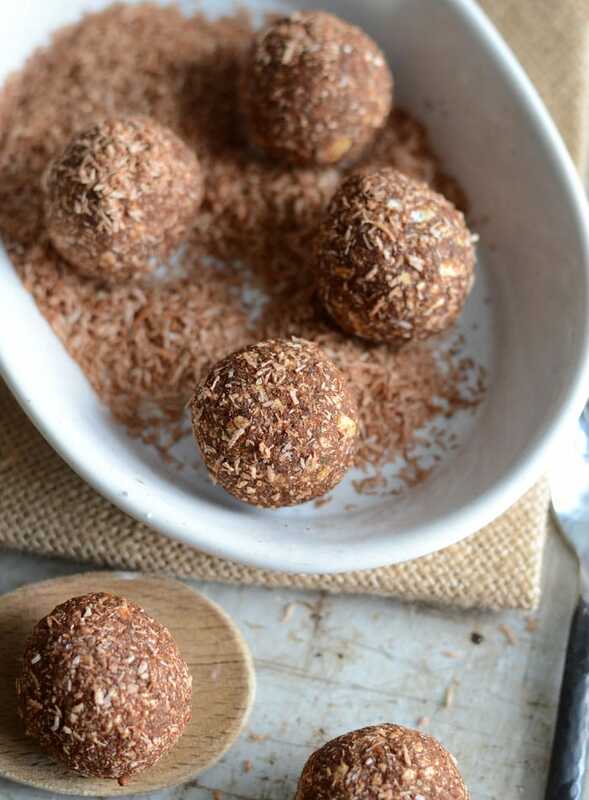 Tahini, sunflower seeds, coconut butter, coconut, hemp seeds and sunflower seed butter are my favourite go-to nut replacements so you can always play around with those to make my other no-bake energy ball recipes nut-free if needed. I made these cinnamon energy balls for my husband because he’s trying to gain muscle and has a ton of carbs to eat right now. These are helpful because they’re dense and he can easily pop a couple to get more carbs on-the-go. Aside from the nutrition, these little treats also taste amazing. 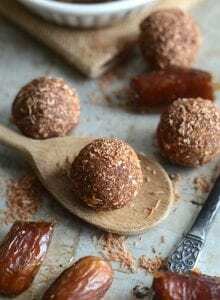 If love caramel, cinnamon and sea salt, you will love these energy bites! The dates give them a beautiful, caramel-esque flavour and the sweet maple syrup and cinnamon just take it next level. I used oats to hold it all together and for a low-fat, high-fiber source of energizing carbohydrates for. I’d highly recommend adding the sea salt, it really enhances the other flavours in these. You can make these in a high-speed blender or food processor. All you need to do is toss in all the ingredients, process until it forms a thick dough and then roll it into balls. They can be stored in the freezer for up to 3 months or in the fridge for a week or so. They travel well so make a good snack to take on-the-go or keep them stashed away for a sweet treat in the evening. They’re also amazing crumbled or chopped up over oats, dairy-free yogurt, banana ice cream or smoothie bowls. 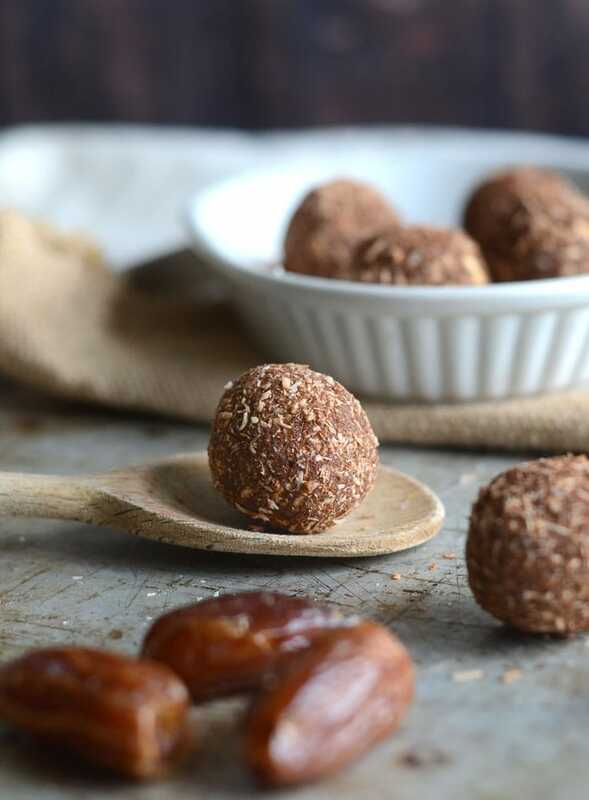 These yummy little cinnamon energy balls are just 80 calories a pop so you can go ahead and enjoy a couple anytime for a healthy sweet treat. Try them straight from the freezer, YUM! They’re also awesome crumbled over smoothie bowls or banana nice cream. Add the oats to a high-speed blender or food processor and pulse a few times to break down a bit. If your dates are very dry, soak them in just boiled water for 10 minutes and drain before using. I used 2 tbsp of cinnamon in this recipe but the flavour with 2 tbsp is quite intense. If you prefer, start with 1 tbsp, blend it up and taste the dough, then add more to taste. These look so good! It’s hard to go wrong with cinnamon. Something like those Cinnamon balls would be good to have on a full-marathon morning on an empty stomach if you must have something in your gut at the running start line right before they fire the marathon gun to start the race. Totally, they’d be perfect for that. These are genius! I also favor macro-counting and it really is excellent to have some recipes that are heavy on a particular macro to fill in the gaps. I am definitely going to check out your other snack balls, but I JUST bought some dates and was trying to figure out what to do with them! Fantastic photos! These look so good! I like the ingredients you used, too. So much lighter and still delicious! I actually did use 2 tablespoons in this recipe and that was good for me. I’ll make a note to start with 1 tablespoon and add more if you want. Thanks for your feedback! 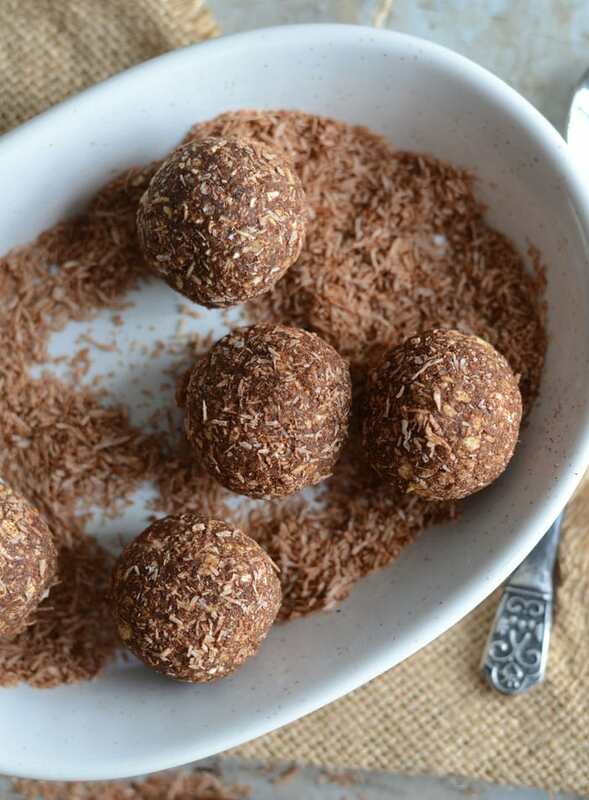 Now this easy peasy recipes.The picture of this dates ball look delicious! I am surely gonna try this.I love healthy food.Is it okay if apply some chocolate syrup on top? Haha, sure, if you want to! Hope you enjoy them. Can you substitute the dates with something else? Just wondering if you have and with what. Thank you! You could try it with raisins, dried figs, dried apricot or dried cherries but I haven’t tried it so I can’t guarantee how they’ll turn out. Depending on how dry the fruit you use, you may need to soak it in hot water before using. They should be nice and soft. Hope that helps. Hi, could these be made in advance and frozen?? Woooh… These balls my god… I loved the recipe completely. The picture of this dates ball looks so delicious! I will surely gonna try this Cinnamon energy balls asap for my hubby.In so love with the healthy food. Thanks for sharing this awesome and Healthy recipe with all of us. Best wishes and Regards. What did you use to dust the outside of the energy balls in the photos? Do you know how much sugar each bite has? Hi Emily, it should be just under 10 grams per serving. Enjoy! I just made these and they are delicious. I did add chia seeds, and an extra tsp of maple syrup. My question in how did you get 80 calories per serving. I just entered the recipe into myfitnesspal and it shows 224 calories, the chia seeds, and extra maple syrup only add 90 calories to the entire recipe, so according to the calculations here, making mine about 85 or so. I appreciate the info! I working on cutting calories and was surprised at the difference. Hi Trish, I’m glad you enjoyed them. How many balls did you make? I made 20 balls, which worked about to about 80 calories per ball. I would check the entry you’re using for dates as well. With my calculations, the dates add 720 calories. Hi,do you think I can omit maple syrup please as dates look enough for me for sweetness? Yes, you can omit it. You may need a few extra dates or a splash of water to roll the balls though. Just make as is first, then add a bit if it’s too dry.